In September of 1842, 12,000 Mexican troops under the command of Gen. Adrián Woll captured the City of San Antonio, Texas. Although the city was only occupied for a short time, it made the citizens of Texas quite aware that they were not safe from invasion. Also this aggressive action by Mexico infuriated the Texans and they were determined to strike back. Texas troops, led by Alexander Somervell, pursued the Mexicans for a while, but Somervell had second thoughts about crossing into Mexico. According to information obtained from The Handbook of Texas Online, he ordered his army to disband and return home by way of Gonzales. Most of the men refused to obey the order and went on to attack the village of Mier, Mexico. The group was eventually captured and every tenth man was ordered to be executed. 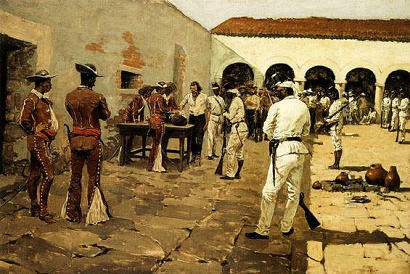 The selection process was made by making the prisoners draw from a mug containing white and black beans. 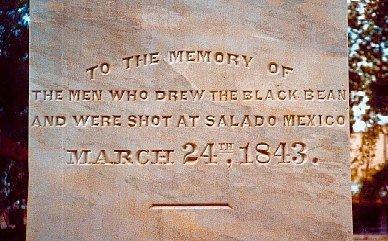 Those drawing the black bean were shot. While researching The Gonzales Inquirer from the year 1894, I came across an interesting article written by George Lord of Cuero. Lord was well known in the Gonzales area and he owned a ranch near Cheapside. But George Lord's biggest claim to fame was that he was one of the survivors of the Mier Expedition. The following is an excerpt of Lord's article in the Inquirer about his experiences as a member of that doomed expedition into Mexico. It has been said that most of the men who took part in this fiasco were political opponents of Sam Houston. George Lord's comments indicate that this was probably true. Lord died February 23, 1895, and was buried at Cheapside. Soon after our arrival [at the Salado] we received the melancholy intelligence that we were to be decimated and every tenth man shot. It was now too late to resist this horrible order. Could the [martyrs] in liberty's cause, who so proudly yielded up their lives for their country have known that their president, Sam Houston, had endorsed their execution by the most villainous of all falsehoods by declaring them brigands, great God, what would have been their feelings? The decimation took place by the drawing of white and black beans from a small earthen mug. The white beans meant exemption from the black death, [there were] 150 white beans and 17 black ones. Capt. Cameron said with his usual coolness, "Well boys, we have to draw so let's be at it," so saying he thrust his hand into the mug and drew out a white bean. Capt. Eastland was the first one to draw a black bean and then came the balance of the men and all drew their beans with that manly dignity and firmness which showed superior to their condition. Some of light temper jested over the bloody tragedy. One said, "boys, this beats raffling all to pieces," another said, "this is the tallest gambling scrape I was ever in," and such like remarks. Those who drew the black beans evinced no emotion, not even changing color. On the contrary those who drew the white beans seemed completely done up, many wept and appeared unmanned. [One] true account of the black bean drawing: Poor Robt. Beard, who lay upon the ground near by exceedingly ill and nearly exhausted from his forced marches and sufferings, called to his brother, who was bringing him a drink of water, and said, "brother, if you draw a black bean I'll take your place, I want to die." The other brother, with overwhelming anguish, said, "no I will keep my own place, I am stronger and better prepared to die than you." These noble youths both drew white beans, but soon after died leaving the Roman legacy to their venerable parents in Texas. J.L. Shepherd, one of the unfortunates it seems was not killed by the executioners. It is supposed that he was only stunned, for the next morning only sixteen bodies could be found, his body being missing. We heard afterward that he was recognized on the streets of Saltillo by a Mexican soldier and shot down. The names of the 17 men that were shot are: L.L. Cash, J.D. Cocke, R. Durham, W.N. Eastland, J.M.N. Thompson, Chas. Roberts, Ed Este, Robt. Harris, T.J. Jones, Pat Mahan, Jas. Ogden, Wm. Rowan, J.L. Shepherd, Jas. N. Torry, Jas. Turnbull, Henry Whalin, and M.C. Wing.